What is the Paleo Diet? What can you eat? Is it healthy? Can I lose weight? This guide provides the answers every beginner needs to know about the Paleo Diet, plus gives you 21 Paleo Diet recipes to help you get started! The Paleo Diet is a healthy eating lifestyle that eliminates processed foods and sugars, grains, and dairy and replaces them with nutritious whole foods and lean protein. Also known as the “caveman” diet, the Paleo lifestyle offers many benefits in addition to helping you shed extra pounds! The basic idea behind the Paleo diet is easy to understand. Eat foods that can be hunted or gathered-like a caveman would have centuries ago. Avoid the others. Lose weight, improve metabolism, and decrease your risk for heart disease with no need to count calories, weigh in, or worry about food portions. 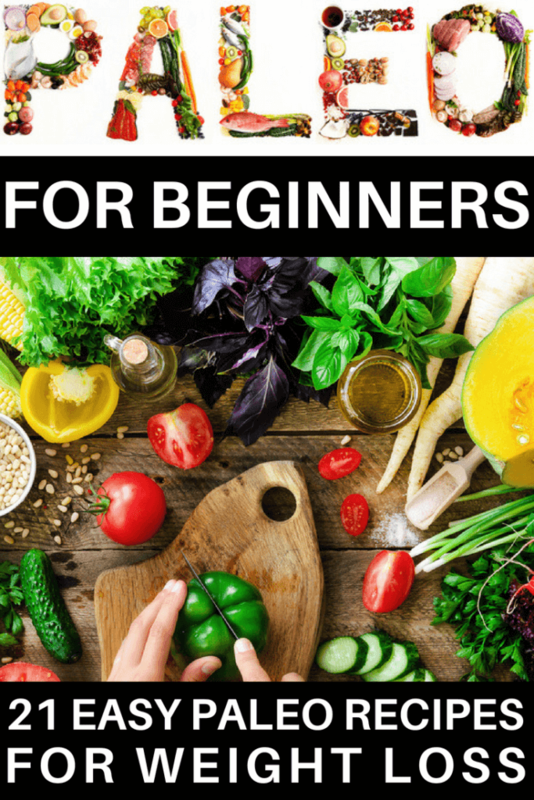 If you’d like to follow in their footsteps, I’ll show you how in this beginners guide which includes tips for losing weight, what you can and cannot eat, ten shopping tips for stocking your Paleo pantry, and 21 easy Paleo diet recipes to get you started! Follow all of the rules for the first 30 days to see results-Especially if you’re trying to lose weight! It may help temptation-wise to clear all non-Paleo foods from your home. Your local food pantry will be happy to accept any unopened foods you need to clear out! Go Low Carb. The Paleo diet doesn’t restrict all carbohydrates, so if you’re looking to drop a few pounds be sure to fill your plate with more protein, healthy fats, and low carb veggies. Practice portion control! One mistake people make on the Paleo diet is over-doing the healthy fats-which can keep you from losing weight. Keep nuts and oils to a minimum. A diet friendly serving of nuts is 1 ounce-not one container! Meal Plan & Prep! Meal planning is the best way to stick to any diet, and Paleo is no different! Plan meals on Saturday or Sunday and batch cook chicken and chop veggies for a few hours. Meal planning will help you lose weight & stick to your budget. 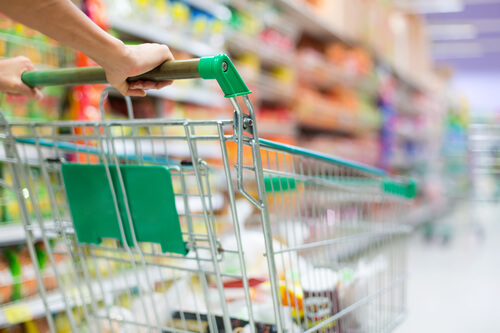 You’re going to have to make some adjustments when shopping for food. Don’t stress! Here’s what you need to know when you’re at the grocery store trying to stock the shelves of your Paleo pantry! 1. Buy fresh, lean meats with no hormones or antibiotics. 2. Buy Grass-Fed & Organic versions of foods like meats, poultry, and eggs. If these aren’t in your budget, grain-fed will work too. 7. Make friends with RAW nuts & seeds without a sweet maple syrup gloss. Add them to salads, muffins, or let them stand alone & eat as a snack. *Just remember-no peanuts. They’re technically a legume & not approved on the Paleo diet! 8. Speaking of legumes, say goodbye to lentils, peas, chickpeas, and beans. They’re also on the Paleo diet No List! 10. Watch what you drink! Fruit juices, sports drinks, and sodas that are full of unhealthy sugar are out! Drink water, tea, and black coffee instead. Throughout the years the Paleo diet has been tweaked and adjusted confusing and sometimes causing drama in the Paleo community. Some Paleo diets include dairy, some grains, and beans while others follow the strict rules of the original diet. Yes, but here’s what you need to keep in mind. Whether you chose a “strict” or “modified” Paleo diet, the best version is the one you can stick with. If you’ve been struggling with your weight and you’re ready for a change then look at the Paleo diet as a lifestyle rather than a diet. Ultimately, your health matters more than than a list of rules. Finding the right combination of foods for your body is more meaningful than being able to shout from the mountaintops that you’re 100% Paleo! Ok, so I know adjusting to a new diet isn’t easy. And the last thing you need to be worrying about is Is This Last Minute Dinner Recipe I’m making even Paleo??? You need a stack of paleo recipes you can depend on to make life easier. So, I’ve collected the most delicious, paleo diet recipes for breakfast, lunch, and dinner that are both easy and (most of them) fast! All of these Paleo diet recipes are fabulous for beginners and paleo pros looking for new meal plan ideas! Delicious “On the Go” breakfast recipe that’s ready in under 30 minutes! Perfect paleo recipe that the whole family can enjoy! Make-Ahead & Freeze for later! This healthy, paleo recipe from The Big Man’s World is like having dessert for breakfast-without the guilt! I know that’s hard to believe since it contains no grains, oil, or sugar & it’s gluten-free, vegan, and dairy-free! 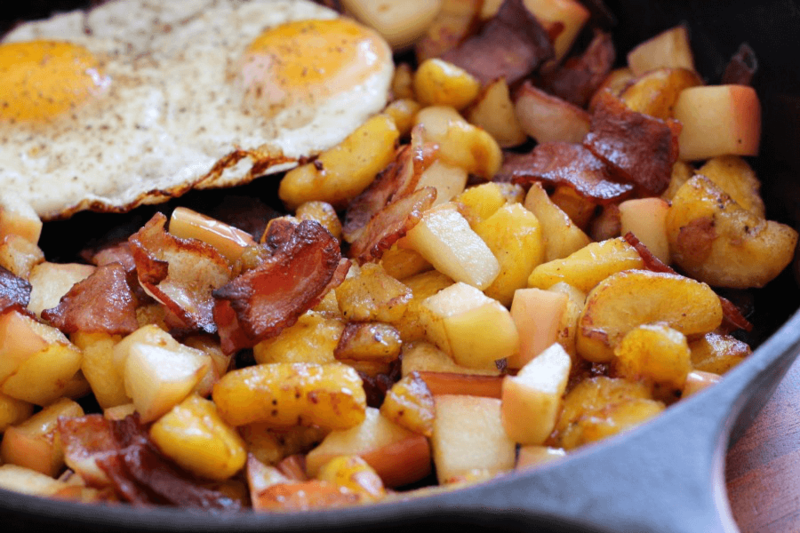 Full of flavor & nutrition this paleo diet recipe combines sweet pink lady apples and plantains with sugar-free bacon. Healthy, easy & delicious! Full of protein & veggies & cinnamon sweetness, this paleo recipe covers all the bases for a healthy breakfast. Bonus: There will be leftovers for multiple morning meals! This gluten-free, sugar-free, paleo diet recipe takes 5 minutes to prep in the blender! The easiest paleo breakfast muffins you’ll find! Strawberries, Avocado, and Pineapple come together in this easy lunch recipe that takes only 10 minutes to put together. Allyson from Domestic Superhero brings you this protein-packed lunch with solid white albacore tuna and veggies that’s easy to make & take to work! Chicken, hard-boiled eggs, bacon, avocado, tomatoes and fresh spinach topped with a one-of-a kind Buffalo Ranch makes this paleo recipe a unique change of pace. Looking for an easy, budget-friendly lunch? You can’t beat this super easy 4 ingredient Egg Salad recipe from Bravo For Paleo! This recipe is ready in 15 minutes & makes a great gluten-free paleo dinner or lunch meal. Loaded with veggies & juicy chicken this recipe makes a well-rounded paleo diet meal. Not your typical salad! When guacamole meets chicken salad you get a flavor-filled lunch that you can serve in lettuce wraps or stand alone! Ready to eat in under 30 minutes, this recipe makes a fab family meal! Spicy meets sweet in this paleo diet recipe that combines ground chipotle and lime juice with ground chicken and onions. With little prep work required, Monica has created an easy paleo dinner meal that tastes (and looks) like you worked all day in the kitchen. Perfect for a busy weeknight meal, this gluten-free paleo recipe is full of nutrients and it’s ready to eat in only 20 minutes! I’m sure you’ll want to add this creamy bacon casserole to your staple paleo recipe rotation. Why? It’s ready in under 30 minutes & tastes like heaven! Gluten-free, crispy chicken tenders that the family will appreciate! Especially since they are ready to serve in under 30 minutes! Grilled cilantro lime chicken comes together in under 30 minutes! But the best part is the creamy, zesty avocado salsa! Ok! I realize that was a lot of info! But in all fairness, we did have a lot of ground to cover! I hope this Paleo diet for beginners helps you start that healthy lifestyle we both know you’ve been putting on the back burner! If you found this guide to be helpful, please share it on Pinterest! For even more recipes, weight loss tips, and healthy lifestyle hacks, please follow my Clean Eating board on Pinterest!